Man, what an unusual weekend! Unusual because it was actually fun. It started off, of course, with the Black Rebel Motorcycle Club concert on Friday night at Sokol Underground. I thought the show was great, but I'm not 100% certain it met my extremely high pre-concert expectations. The set list was primarily from the new album which is to be expected. They sounded fantastic, and the playing was top notch. My only real complaint -- if I had to make one -- was that the band barely acknowledged the audience at all. No "Hello Omaha." No "It's great to be here." Nothing. Until the encore. I don't need a ton of stage banter, but I'd like a little bit. All told, BRMC played close to two hours and most of the songs I wanted to hear, I was able to hear. They didn't play "Stop" which is surprising since it was the single from the Take Them On, On Your Own album. Omahype has a more detailed review of the show, and they took some fantastic pictures which can be seen here. The crowd was a little lighter than I had hoped, but I spoke with 1% Productions who said that the show ended up breaking even. I'd hate to have anyone lose money just because the Omaha hipster elite refuse to acknowledge the greatness of BRMC. Saturday night I had a dinner party to attend, and it ended up being a lot more enjoyable than I had anticipated. The meal was fantastic and the conversation was quite interesting -- lots of politics and whatnot. Pretty much everyone in attendance was on the "same side" in terms of politics (all Dems), so there wasn't much in terms of argument. I think we all agree (as does most of the country) that any Democrat in the White House is better than the current occupant, and better than any of the GOP contestants who offer nothing more than staying the Bush course. 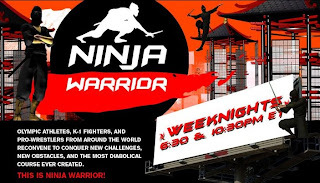 After dinner, I discovered the greatest TV show in the history of TV -- Ninja Warrior! The show is from Japan, and is aired on the G4 cable network. I think G4 is a relatively new channel. The show features male and female Japanese contestants attempting to navigate a very difficult obstacle course in a short amount of time. The obstacles are no easy feat, and most of the contestants fail miserably. In fact, the failing is probably the best part. If you are unable to navigate the obstacle you end up falling in a pool of brown, murky water. It looks quite gross. My description of the show does not do it justice. You need to see this show. It's quite exciting and is absolutely addictive. We watched it for nearly 2 hours on Saturday night. G4 has been running marathons of the show lately, so new viewers can get caught up. I had to miss The Hold Steady show because I was on the air at the time. I haven't heard anything about it yet other than the attendance was strong -- better than BRMC. My show went well, and I got the new single from Rooney (though I didn't really like it). It was a little uneventful since many people who would ordinarily listen to me were at THS. Not too much else to report. I'll try and have more later.